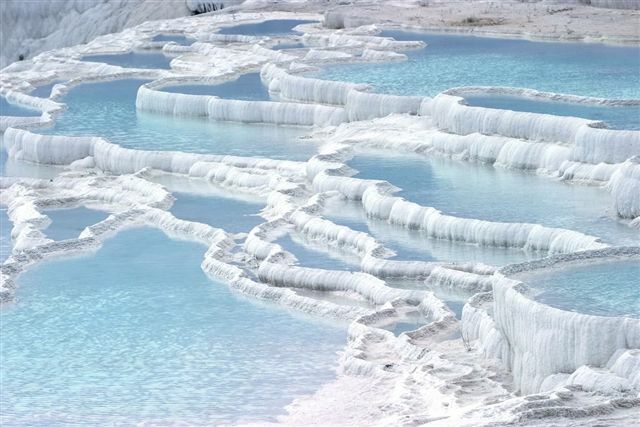 The Marble Stairs of Heaven on Earth: Pamukkale | Do You Know Turkey | Turkish Tv Series & Drama, Turkish celebrities, travel information about Turkey and Turkish cusine. The travertines and the natural spring waters are used as natural healing pools and served as a spa center from ancient times to now. The stunning white calcium pools, which cling to the side of a ridge, have long been one of the most famous picture postcard views of Turkey. Pamukkale, literally meaning “cotton castle”, is also the site of the ancient city of Hierapolis of which there are many interesting ruins, and is a very popular destination for a historical visit. It can get quite hot in summer, a hat and especially sunglasses will certainly be very helpful against the sun and the reflecting sun rays from the chalky cascades. On the other hand, the cold winter climate could make the experience slightly uncomfortable. Climbing up the cascades barefoot, with cold water running downstream will be a tough task. The nearest major city is Denizli, where you will likely arrive first before getting to Pamukkale. Closest airport is Denizli – Çardak Airport is 65 km or 1 hour away and there are flights twice daily toIstanbul. Izmir Adnan Menderes Airport is another alternative to the area. Pamukkale is 252 km from the airport, a drive of about 4 hours (4-1/2 to 5 hours by bus). From Denizli bus station, take a dolmuş, a type of cheap communal taxi that usually seats about 10 (but it’s possible they’ll squeeze in more), from nearby Denizli. Frequent mini-buses serve the village of Pamukkale in a 20 minute ride. It cost 3 YTL per trip.It is also possible to make rezervation the bus ticket from Pamukkale Village. And the bus company can arrange shuttle bus to bus station if there is enough number of people. The nearest train station is in Denizli, which currently has services from Izmir only. The Istanbul service (Pamukkale Express) was suspended in 2008, presumably because of track renovations, and it is not certain when/if the services will re-start. Even when you’re way on the edge of the village, you can reach everything (i.e. the village center and the travertine pools) on foot in about ten to fifteen minutes. 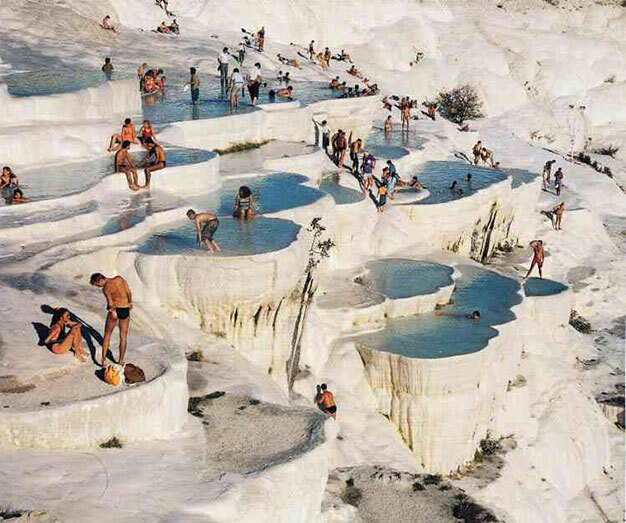 These are a set of bizarre calcium cliff bathing pools overlooking the town of Pamukkale. You can access them via a toll-booth, however tough pollution control regulations require removing your shoes in order to walk on them (so bring something to put your shoes in! ), so the travertines stay white as ever. This job is made tougher in winters when the water flowing down the chalky cascades will be freezing cold. You can avoid the climb and take a taxi to the top of the hill and enter from the side of Hierapolis. But the real charm of the place lies in experiencing these travertines. These petrified waterfalls/travertine are a UNESCO World Heritage site. The admission costs 20 TL per entrance. 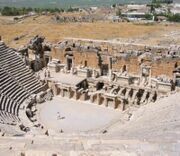 This price includes addmission to nearby Roman city of Hierapolis as well. Lower parts of the travertine cascades are reported to have better views than the top. Day tours are offered for around 45 Lira (as of January 2010) including English-speaking guide, entrance fee to Hierapolis and the travertines (this alone costs 20 Lira) and buffet lunch. Different companies seem to offer similar tours, ask around. Such tours leave from the Pamukkale bus company office on the main street opposite the travertines, and the Koray Hotel. There may be tours starting from other places around the town as well. For those who rather not visit the travertines under the scorching sun, there are also night tours as well, which start from small guesthouses. The old Roman Baths, is one of the largest structures in Hierapolis, which has been the Archaeological Museum since 1984. Inside are exhibits from excavations of the area. Museum Tel: (0258) 241 0866. Opening hours: 08:00 – 19:00 (Summer); 08:00 – 17:00 (Winter). Closed Mondays. The ancient city of Hierapolis, the original site of Pamukkale, was known as a Holy City in archaeological literature because of the abundance of temples and other religious structures in the area. Although there is limited information on the founding of the city, it is known that Eumenes II founded it and named it after Bergama’s mythical founder, Hiera, who was the wife of Telephos. It was an important centre during the Roman and Byzantine periods, and a centre of Christianity since the 4th century. The colonnaded main street, is 1km in length, divides the city into two sections from end to end. At both ends are monumental doors outside the Byzantine ramparts because huge sections of the doors were constructed during the Roman era. On the South Byzantine Door, dating back to 5 BC, is an epitaph dedicated to Emperor Dominatian. The North Byzantine Door dating back to the same period is at the junction between the road and the ramparts. The city was encircled with walls around the north, east and south, in the 5th century BC. 24 square towers were added, but the majority of these have since collapsed. Of the four entrances, two are the monumental doors and other others are small. Now part of the Pamukkale Museum and south of the Thermals Baths, the layout of the Roman Baths is typical of the era: A wide courtyard is at the entrance, through which is a rectangular area with large halls on both sides. There is evidence suggesting that the interior’s huge walls were covered with marble. At the north and south of the main complex are two main halls essentially used for the private use of the Emperor, and for ceremonies. The remains of the baths date back to 2nd century BC, and the area is now covered with marble and a large section is part of the Pamukkale Museum. Near the Museum are the foundations of the Temple, constructed on the Plutonium spring and dedicated to Pluto, the god of the underworld. It still gives off deadly poisonous gases and in front of the temple, a grate has been installed over the underground entrance to the spring to prevent inquisitive visitors. It was the site of an ancient religious cave, where Apollo met the mother goddess of Cybele, and sources suggest that she descended into the cave without being affected by the toxic fumes. The upper parts of the Temple date back to the 3rd century, and is accessible through a wide staircase. The restored Roman theatre dates back to the 2nd century and the stage buildings and elaborate reliefs are in exceptionally good condition. Construction began in 62 AD by Flavius two years after a large earthquake, and completed in 206 AD. It once had a capacity of around 12,000, and adorned with columns and statues which were unearthed during excavations. On the backstage walls are marble bas-reliefs. The theatre is still the venue for the annual International Pamukkale Song Festival in June, during which 7000 spectators can be seated. There is a cathedral, a church with pillars, and two other churches in the city centre belonging to the 6th and 7th centuries, with smaller chapels at the northern end of the city. The necropolis, in the northern end of the old centre, is the largest in Asia Minor and continues along both sides of the road for nearly 2km. Limestone and marble were both used during the construction of the graves, although marble was more common for the tombs. The northern necropolis includes characteristics of tombs, graves and monuments, which date back to early Christianity. The tombs that have architectural characteristics of houses are considered the most valuable parts of the necropolis. Founded on the southern back of the Curuksu River, the site of ancient Laodiceia, or Laodikya, is 13km south of Pamukkale. According to ancient sources, the city was established by Antiochus in 261-263 BC, and named after his wife. This was one of the most important and renowned cities of Anatolia in the first century BC, and the majority of works of art here belonged to this period. The Romans put great importance to Laodikya and declared it as the centre of Cybria. The whole area contains the largest stadium in Asia Minor, a gymnasium and baths complex, and the foundations of an Ionic temple. The region contains one of the seven known churches of Asia Minor, which indicates the high esteem in which Christianity was placed. A destructive earthquake levelled the city in 60 AD. Constructed in typical Roman architectural style, the Grand Theatre is in the northern area of Laodikya. Although the stage has been completely destroyed, the areas for the orchestra and audience are in good condition, and has a capacity of around 20,000. 300m northwest of the Grand Theatre, this had a capacity of 15,000 and was constructed in Roman style. The stage has completely collapsed, and there is slight damage elsewhere to the interior. Built in 79AD, the stadium is measures 350m x 60m. Having the architectural properties of an amphitheatre, it has 24 rows of seating although significant parts of its have since been destroyed. According to an inscription unearthed during excavations, Proconsul Gargilius constructed the gymnasium in the 2nd century, as a dedication to Emperor Hadrian and his wife Sabina. Located on the main street, the Monumental Fountain is a Roman structure with two pools and carved shelves on the walls, and restored during the Byzantine period. Lying between the small theatre and the monumental fountain, the Temple of Zeus is located on the east of the colonnaded street. It was constructed on the south of the columned street adjacent to it. Only some parts on which the temple was perched have still being erected.Main entrance is on the west part. The waters of this spring, which is part of the Pamukkale system, is 5km south of Pamukkale and considered to be good for the heart, hypertension, rheumatism, sciatica, lumbago and skin diseases. The lime solution in the water, which comes from the travertine pools 18km from Pamukkale, has therapeutic qualities that have been acknowledged for centuries. Religious ceremonies and festivals have been performed around the source of the spring, and it was a popular destination for wealthy and powerful people who came to be cured of their ailments. The great (12,000-seat) Roman amphitheater of Hierapolis should not be missed, and lies just above the travertines. Swim with roman ruins in a large natural swimming pool located just past the topmost travertines. Another lesser known site, but one that holds a considerable significance Biblically is Laodikya, just 10 km (10 minutes on a local dolmuş) from Pamukkale on the Denizli road. It’s mentioned in the Bible as one of the 7 Churches of the Revelations and even though it hasn’t been reconstructed as much as the more famous sites like Ephesus, is a great place to experience the Roman history without the crowds. A peaceful way to spend a day looking at ruins but also the beautiful scenery there as well. Karahayit, the red spring is also 5 minutes from Pamukkale, not even nearly as big as the calcium outcrop, but worth a look or if you want to try their mud baths. Springs and mud bath located at the northern edge of the town. Kaklik caves are like a small version of Pamukkale, but in a cave, underground and are about 30 minutes from Pamukkale. You can walk down barefooted in the waterfalls from the village. The place is crowded when the tour-buses arrive. No shoes are allowed on the travertines. If you don’t want to walk back to top, you can use the buses dropping off people back to top, which depart from near lower end of the travertines. You should wear swimming suit. A lot of people bath in the baths here. It is also worth making the effort to get to the remains of the ancient city of Aphrodisias—one of the best preserved Roman sites in southeastern Aegean. You can rent a van from Denizli to get there. Local bus companies will arrange bussing for 30-40 TL. Bathe in the mineral hot springs. This is an enclosed pool, with additional entrance fee of 25 TL as of July 2011, above waterfalls. Of moderate interest might be visiting Denizli. It’s a bit dull but there’s a lively market. The Pamukkale/Denizli area is famous for its cotton and the homewares. These are becoming sought after world wide (Arnold Schwartzenegger decked out his house in curtains and furnishings specially made in Denizli – so the story goes!) and the best place to go is the town of Buldan, about 30 minutes drive from Pamukkale. Many of the other souvenirs and traditional Turkish wares that you can find in other parts of Turkey are cheaper around Denizli/Pamukkale because they are produced there. The best and freshest food is to be found in the small family run pensions, but for a great open air restaurant where you can eat ‘borek’ the Turkish pancakes and gaze across the valley, try Alis on the main highway just before you come into the town. Mehmets Heaven, on the main street near the Travertines has an excellent view of Pamukkale from his porch out back. Great food and well priced. Super nice owner as well. Kayas Wine House, Kale Mah. Ataturk Cad. No 3 (centre), ☎ 0090 258 272 2267. Recently started serving food, not only Turkish but also international (Korean, Japanese…) in traditional but trendy surroundings. Located in the centre of town, close to all the major hotels. Lamuko’s Lokanta, Main Street Pamukkale, ☎ 0090 542 390 8175. Japanese and Korean food in the centre of Pamukkale, next to Pamukkale Bus Company office. Delicious! Kale Hotel, Atatürk Cad. 16 ((on the main street in the centre of town)), ☎ +90 258 272-26-07. This place has great Chinese, Korean, and Japanese food at an excellent deal. It’s also got Turkish food, but is a great change if you’d like something other than gözleme, pide or kebabs. Entrees are around 10 TL and it has beer and wine. Ayran is a salty yogurt drink similar to a salty lassi. It may be an acquired taste, but should be tried while in Turkey. The wines produced in the Pamukkale area are becoming quite famous and are winning awards for the quality and standard. Note that Turkish wine may disappoint. Raki is a traditional Turkish drink, generally served with mezes (tapas like appetizers, generally followed by a fish or meat dish). With an anise-seed flavor, it may be an acquired taste. Great with fish or any long meal as it is meant to open up your appetite. Efes or Tuborg are the go-to beers in all of Turkey, and are often the only beers available. There are small family-run pensions at the village south of the travertines. Most have swimming-pools filled with the warm greenish milky water from the travertines. They also offer very delicious Turkish food. Artemis Yoruk Hotel, Atatürk Cad. 48/A, ☎ +90 258 272-26-74 ([email protected], fax: +90 258 272-26-75), . Hotel just opposite the bus stop with a pool and a nice garden, and a rooftop restaurant which serves traditional Turkish food. Rooms with en-suite, TV, and air-con. Owners can speak English. € 12/€ 20 single/double rooms, including breakfast. € 5/€ 7 pp dorms without/with breakfast. Hotel Dört Mevsim (they also go by the name Four Seasons though neither affiliated nor has any similarity to the hotel chain), ☎ +90 258 272-20-09 ([email protected], fax: +90 258 272-26-32), checkin: 7:30AM-11:30PM; checkout: 11:30AM. Hotel with free wi-fi, swimming pool, free car park, babysitting service, and air-con. They allow pets at no extra cost. They also have a campground on their yard. € 14/€ 17 sinlge/double rooms, € 10 pp dorms, all including breakfast. Visa, Euro/Mastercard are accepted. Kale Hotel, Kale Mah. Atatürk Cad. 16 (on the main street in the centre of town), ☎ +90 258 272-26-07([email protected], fax: +90 258 272-26-07), . checkout: 11AM. A family-run guesthouse. Rooms with satellite TV. Roof-top terrace, swimming pool, free wi-fi, Ottoman Corner, restaurant, day trips and excursions. € 12. Koray Hotel, Pamuk Mah. Fevzi Çakmak Cad. 29, ☎ +90 258 272-22-22 ([email protected], fax: +90 258 272-20-95), . Friendly and family-run, with garden bar and restaurant and a large swimming pool. Rooms with satellite TV. The hotel can organize day tours, express bus tickets, plane tickets, and offers a transfer service. Melrose Allgau Hotel, Vali Vekfi Ertürk Cad. 8, ☎ +90 258 272-22-50 ([email protected],fax: +90 258 272-31-20), . A nice family-run pansiyon at the eastern end of town with nice rooms, all of which have air-con. The friendly owners serve cheap but tasty home cooked meals. There’s a laundry service and a pool filled with spring water. They also used to allow campers to put up their tents. € 20/€ 25 single/double rooms, including breakfast. Credit cards are accepted. Öztürk White Hill Hotel, Pamuk Mah. Fevzi Çakmak Cad. 31. A small family-owned hostel. Sinter Terasse Hause Hotel, Pamuk Mah. Hasan Tahsin Cad. 22, ☎ +90 531 708 81 16([email protected], fax: +90 258 272-22-33), . A comfortable, famıly run hotel with wireless internet access and cable TV. Rooms with en-suite, and air-con. Staff can speak English and German. € 20/€ 28 single/double rooms, including breakfast. Venüs Hotel, Pamuk Mah. Hasan Tahsin Cad. 16, ☎ +90 258 272-21-52 ([email protected], fax: +90 258 272-29-93),. A comfortable hotel with wireless internet access, a swimming pool filled with thermal water from travertines. Rooms with en-suite, and air-con. Staff can speak English. € 20/€ 28 single/double rooms, including breakfast. Denizli is a short bus ride away, and from here one can transfer to, among other options, Selçuk & its Roman ruins of Ephesus, or the popular Mediterranean resort city of Antalya. Just shop around at the various travel agencies scattered throughout Pamukkale to get the best price quotes, though beware their mark-ups for fees/”taxes” (in particular, Neşe Tours charges high hidden “taxes”: e.g. 45 TL for a bus toBergama that was supposed to include the 3 TL dolmuş price to Denizli, when in fact the dolmuş must be paid extra upon arriving in Denizli, and one could buy the same Bergama bus ticket for a mere 30 TL at the Denizli bus station counter).